Plans for the Tercentenary are progressing extremely well, with orders having been delivered by the Commanding Officer to the Regiment at the beginning of May, and a detailed back brief delivered to the Colonel of the Regiment and key Trustees. Can I please ask you to support your Regiment by booking tickets here for the various events sooner rather than later. In particular we would like as many of you as possible to purchase tickets for lunch; the earlier the indication as to how many we need to feed the better! Please register your attendance to the Cocktail Parties on the evening of Friday 17th July via e-mail to 300krh@gmail.com. The Cocktail Parties will be taking place inside camp in the following locations: WO’s & Sgt’s Mess and Junior Ranks Club (Aliwal Arms). The Regiment will have sole control over VCP 1 and the RSM will be running a security detail to smooth your transition into camp; all we need to know is your intention to attend in order to get you in to barracks on the night. There has been a change in venue for The Officers’ Mess cocktail party which will now take place outside of camp at the Tidworth Polo Club House; those planning to attend will need to purchase a ticket here. For those wishing to visit The Officers’ Mess, plans are afoot to open the Mess on Sunday morning – more details to follow. The road-works that we feared might be taking place in the Tidworth area have now been cancelled so we hope the journey will be much easier. Full details of routes, road-works and car parks will be published on this website in due course. Guests are encouraged to leave plenty of time for their journey and arrive early to avoid disappointment. Sadly, given the high profile nature of the event, tail backs are likely to be a reality on the day, so please plan accordingly. There will be a limited amount of seating available at the parade. The majority of this seating will be pre-allocated to VIPs and families of the serving Regiment. The remainder will be available on a first come, first served basis. There are two large areas available on the grass banks facing the parade ground for you to bring your own seats or rugs should you so wish. A map to familiarise yourselves is available here. Whilst we are providing marquees with limited seating, it is the perfect opportunity to take your buffet lunch away to be enjoyed in the style of a picnic. You may wish to bring rugs and seats for this purpose. There will be six service points from which you can exchange your ticket for access to the comprehensive buffet. Cash bars, selling both alcoholic and non-alcoholic drinks, will be set up in the marquees and run by serving soldiers. Amongst the range of drinks on offer will be a specially brewed Tercentenary beer called ‘Ten to Ten’, which has been created by the soldiers in the serving Regiment (with the help of Hook Norton brewery). In a change to previous communications there is now a requirement to register the attendance of children under the age of 10. There will be no charge for their food, but we do only invite those who have purchased lunch tickets themselves to apply for under-10s tickets. The reason for this is a need to know how many are coming so that we can cater accordingly. Children’s tickets can be ordered here (choose the ticket you require). All on-line and postal ticket sales close on Friday 10th July. The Dress for civilians is ‘smart casual’. The dress for Old Comrades is Bowler Hat, umbrella and medals for Officers and suits with medals for soldiers. The Dress for serving officers at ERE is Blues (if you can provide your own cross belt) or Service Dress, and for soldiers it is Service Dress. We have commissioned a bespoke Tercentenary line of merchandise that will be available for pre-order purchases here. The first exciting product is our range of limited edition Tercentenary Mugs that are now available for pre-order here (medium) and here (small). They are selling fast so please order early to avoid disappointment. Your order will be available for collection on the day. Following three weeks of well earned rest, the Regiment returned to Aliwal Barracks in January to continue its role as the British Army’s Lead Armoured Battlegroup. Despite being at high readiness there was still plenty for each squadron to be getting on with that would see them fulfilling a myriad of military and extra curricular activities. On the military side of life, A Sqn took on 12 CR2 from Ajax Sqn, RTR, which would give the soldiers and junior officers of the Sqn plenty of time going about their core business. BGHQ, with the support of Comd Tp, completed the first of several MUDDY HAWK exercises; a chance for the command element of the Regiment to practice and improve its ability to plan and execute operations. Away from the green side of things there was a lot going on ensuring the Regiment was well represented in its usual winter sports. The Alpine Ski team had moved on from their training in Verbier, Switzerland, to take part in a variety of competitions across the Alps. Capt Joe Williamson finished off a cracking season by qualifying not only for the Army but also the Combined Services team and competed in the British National championships. The Nordic Ski team also fared very well considering their almost entirely novice status and have laid some excellent foundations to build on next season. On top of this, A Sqn managed to send 28 of its own members off on their own Ski trip, allowing a good helping of complete amateurs to try skiing for the first time. February kicked off with C Sqn deploying on ranges in Lulworth to practice and prove themselves as masters of their trade, ready to take up the high readiness baton as part of the 1 YORKS Battlegroup in April. BGHQ deployed on to Salisbury Plain to carry out its second MUDDY HAWK exercise, with its eye very much fixed on the upcoming Combined Staff Tactical Training Exercise (CSTTX) in March. The rest of the month saw every Sqn deploying, in the form of a sqn of CR2 or Comd platforms, to support a number of different exercises. The month ended with BGHQ deploying on its final MUDDY HAWK exercise and getting itself in a good place for the subsequent deployment to Germany the following month. Throughout the first two months of 2015 most of the Regiment had been keeping its eye on March and the key events it would bring. First of these was for C Sqn and its part in Ex TRACTABLE; a chance for the 1 YORKS Battlegroup and its various supporting elements to practice and demonstrate their ability to deploy both their equipment and manpower ready for operations. 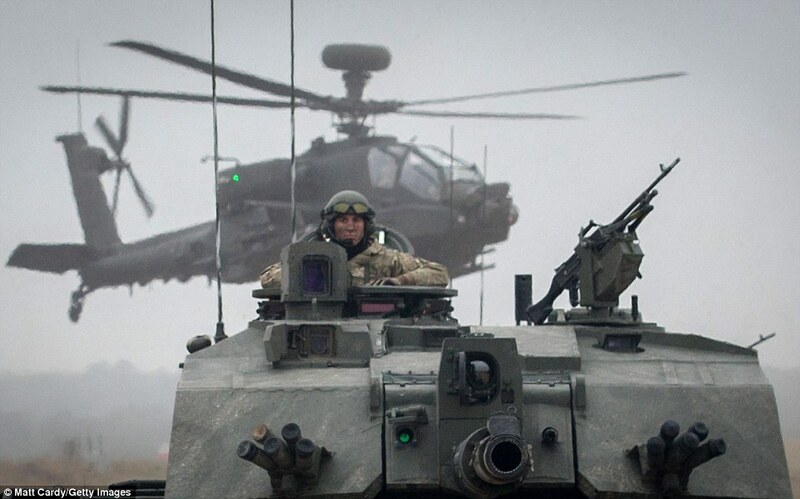 This was conducted on Salisbury plain and, as ever, C Sqn showed the KRH to be a welcome asset to any Battlegroup. Ex TRACTABLE culminated in a Combined Arms Demonstration on the Plain, which allowed C Sqn to show off their tanks’ capabilities and pose for some very good photos with Apache helicopters. For the rest of the regiment the key event for March was the deployment on CSTTX in Germany; giving BGHQ and its subordinate Sub-units the opportunity to plan and execute operations in a virtual environment. This proved an excellent training opportunity for BGHQ when it was taken away from the comfort of planning operations on flat open countryside and thrust into a Fallujah style city, a task that certainly tested the brains of all involved. The first two weeks of April allowed the Regiment to put their feet up and take a deep breath following what had been a very busy year. 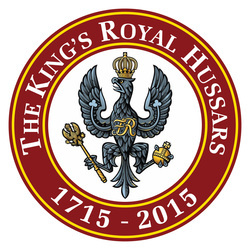 This leave period also marked the end of the KRH BG’s time as the Lead Armoured Battlegroup, which meant we could now switch from looking at the Army’s strategic aims and start looking towards regimental life and the upcoming Tercentenary celebrations. Leave was immediately followed by a Battlefield Tour to Monte Cassino, which included a contingent of NCOs and Officers commemorating the 70th anniversary of the battle of Medicina, where we paraded through the town and were hosted by the local Commune for dinner alongside two 14/20th King’s Hussars veterans and a number of old comrades. The event was thoroughly enjoyed by all who attended.